Desk Switch: Students have ten seconds (count down from ten) to find another desk to sit in that is in a different part of the room than his or her normal desk. Students stay in that desk for the rest of the lesson. Why? Two reasons: First, switching desks gets them up and moving. Second, sitting in a different place in the classroom will give them a different perspective and wake up their brains a bit. Wander as you teach. 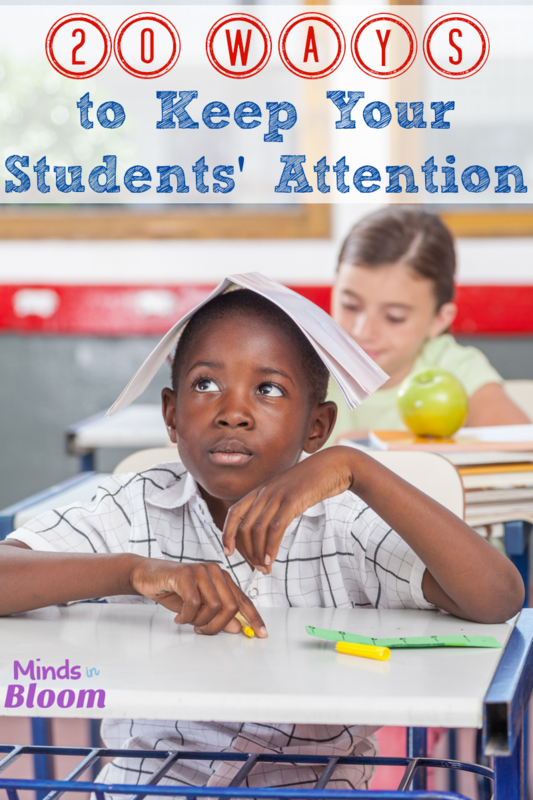 If you don’t need to be glued to the board, then wander throughout the classroom. Most kids will track you, which will keep them alert, and if you see someone having trouble focusing, you can stand right next to him or her for a quick perk-up. Give each child a small ball of play dough to fidget with if you are doing a lecture-type lesson. Throw students a foam ball when calling on them to answer a question. Randomly and frequently ask students to repeat what you just said. Choose a fun word, such as, “Shazam!” or “Bazinga!” Every time you say the word, students must use both hands to hit the tops of their desks two times and then clap two times. Say the word several times throughout the lesson. It will wake everyone up! If you have experience in theater, improv, or just like to have a little fun, teach a small portion of the lesson with an accent or imitating someone famous. With younger students, teach with a puppet or give a voice to a stuffed animal. Throw in a joke every now and then. Use student volunteers. Any time you can call a few kids up to the front to be part of a demonstration, do it. It can be as simple as having them hold up signs (rather than displaying the same information on the document camera) or writing an answer on the board. Better yet, just call on students to help rather than asking for volunteers. If a lot of kids look sleepy, stop talking and write a simple command on the board such as: “Put both hands on your head.” The silence should alert day dreamers that something is going on. Follow up with two more written commands. Make the last one something with sound just in case a few kids haven’t caught on, such as, “Clap three times.” Continue with your lesson. Wear bright colored clothing. If you want to keep their attention, you should be the most interesting thing in the room. Have students explain something they just learned with partners. Require a response from everyone, rather than calling on one student, by using individual white boards or by having students signal yes or no with sign-language. Teach outside. This, of course, could have the opposite effect with students being even more distracted, but on a beautiful day it could be a nice break for everyone to sit under a tree with a clipboard rather than inside at a desk. Animate those PowerPoints! If you don’t have time or know how to do it yourself, you could probably find a helpful upper-grade student who could add some animation to a PowerPoint that already has the content. Require students to take notes. Every so often, have them do a quick, related sketch in the margins. For example, if you are learning about Abraham Lincoln, give them 30 seconds to draw log cabin in the corner of the paper. Throw in a higher level thinking question that is related to the lesson (but not part of your objective) and have a quick discussion. For example, if you are learning proper ways to use a comma, ask the students which punctuation mark they think is the most important and why. Questions like these are also fun to put at the bottom of a worksheet and have students answer on the back. This post was written in response to the Five-Star Blogger Challenge posted on The Organized Classroom Blog. Take a peek at the link up there to see more great Five-Star Blogs! Did you get a new idea? Have one to add? Please let us know with a comment! 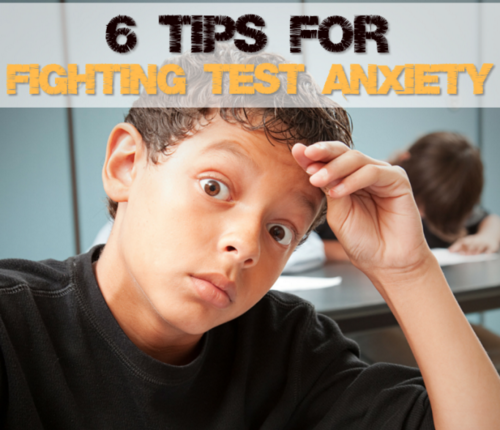 6 Tips for Fighting Test Anxiety Teach Your Students to Set Their Own Learning Goals and Boost Learning 10 Ways to Help Struggling Students Grow Why Some Children Pay Better Attention Than Others Attention Signal Ideas! That's my theory in my wild, clown-esque attire — filled with polka-dots and every other pattern under the sun: KEEP THEM LOOKING AT ME! Thanks so much for your comment, Debbie! I love your colorful outfits! I am sure you have no trouble keeping students engaged! These are awesome! Our school implements the "Take 10" program and it gets the kiddos out of their seats often in a meaningful way! I'm proud to have earned my 5 star blogger badge too! Thanks for sharing!!! Thanks so much for commenting! I hope they will help! Great ideas. I love the joke and the idea of writing something to have them do. I've been throwing in comics and quick songs on power point slides in between content as a little brain break and I love it. Now I'm going to add slide with directions of something to do. 🙂 I teach high school and I love all the bloggers from the elementary schools…you all are so creative and have the best ideas. Hopped over from Charity's challenge! I love number 5…throwing the ball. Thanks for sharing these great ideas! Susan, I am so thrilled that these ideas will work with high school students! Sandra…I used the foam ball A LOT! Love these – will try a few as soon as possible. I observed a really great Prep teacher use very animated body language and her voice was excellent.. .as the 5 year olds started to tire she would exclaim loudly ‘Oh my gosh I just had the most exciting idea!!!! !’ this would stop them in their tracks and then very very quietly she would lean forward and whisper (forcing all the students to lean forward to hear her) ‘I think we should do xyz…’- every now and again she would become very animated and even fell of her stool once to keep them focused on her. She also kept a great pace in the classroom – it was really inspiring to watch! Wonderfully useable hands in tips! Thanks, I'll print and read over and over! I'm a new follower! After scrolling through your blog, I was amazed by how much great information you're sharing. Thanks for all of the practical strategies. It gives me lots of options to choose from as my students' attention becomes harder to maintain. Great post – definitely a 5-Star Blogger! Thanks for linking up! Love this post…I'm printing it out and displaying it in my classroom! I found you through the 5 Star Challenge! Stopping by to check out my fellow 5-Star bloggers!! I love your ideas. I am a homeschooler, and find that fidgets are an invaluable tool, even in our home setting! Thank you all so very much for commenting. I am planning on getting to the rest of the 5 star blogger posts this weekend! Looking forward to visiting you too! I am really into Mickey, Disneyland, really anything Disney, so i try to wear at least one Mickey item a day for the kids to find. I call it "My Hidden Mickey". The kids really enjoy it and so do I, as it keeps me laughing and smiling throughout the day. As a substitute teacher I used an English accent on a notoriously difficult class. They were wonderful and talked about it until the school year ended. It also made other classes excited to come to math! I also make jokes about my name and use odd sayings. I'm going some of these tips in the future too! I really like the bazinga idea! I always circulate and frequentky throw balls or have them stand up but a voice command with a specific non related response never occurred ti me! These are great! I did middle school last yr n I joked alot w them but this yr I'm going to be doing 1st gr so I do plan to use some of these!!! Love this article. At EDWorks we have historically worked with high school students but are starting to work with the full K-12 spectrum. This strategies are great because they can apply to all grade levels and are so simple to implement. Thanks for sharing! Wow this is going to help me so much because i have fidgity class, but they will also zone out so easy. I just started trying this but i found playing music at the beginning of the day while they are working on the bell work has helped them focus a lot better than they have been. But i can't wait to try a few things on the list i know the kids will just flip! It also combines google images and sounds with the creation process to make things easier. Love the tips-thanks for sharing! Great list! I often have them answer me in a different accent. Like, "read this in your best Australian accent" or "say this in your robot voice." They think it is hilarious and more students are eager to respond! Love the ideas to re-energize the class. My 2nd graders are often off on Mondays…I love the changing seats, and throwing a soft ball to get or keep them alert. TX! I just started following this blog. There are so many wonderful ideas! Thanks for posting! I love idea #7 and I can’t wait to try it. I know my sixth graders are going to enjoy it. During math class I try to give my students a “stand up and stretch break” every 15 to 20 minutes. It gives them a quick break and they are almost always ready to get back to learning. Love the Bazinga trick! Teaching reading after lunch…this will come in handy! These are brilliant! As a secondary maths teacher in the uk, these will be very useful in my lessons. I also find wearing bright clothing (and sparkly eye shadow!) helps me if I am having a tough day. Great post! These are some really great ideas that I'll be sure to try out soon. Keep up the good work here! Thank you Rachel. These are wonderful suggestions. These are awesome! Our school implements the “Take 10” program and it gets the kiddos out of their seats often in a meaningful way! I’m proud to have earned my 5 star blogger badge too! Thanks for sharing!! !